1. On 29 January 2017, Mr. Trump warned the leaders of the Islamic Republic of Iran (IRI) of playing with fire after the testing of the Iranian ballistic missiles, which was conducted on the same day. Indeed, according to the statement of the adviser to the Iranian Revolutionary Guard of the leader of the Islamic Republic of Iran Sayyid Ali Hosseini Khamenei, Mahatba Dhualnuri, these missiles have such a range that they could easily reach the United States military installations in Bahrain or on the island of Diego Garcia in the heart of the Indian Ocean. This is clearly not in the interests of the Pentagon strategists, as it means losing the multifunctional essential base from which the US can project its military force onto East Africa, the Middle East, South and South-East Asia, and the South China Sea. 2. In the course of last summer, the clashes (which had previously occurred in the Persian Gulf – PG) between Iranian ships and American vessels, which were accompanied by helicopters and the aircraft carrier Nimitz, and were deliberately and repeatedly undertaking a show of force, as if testing the capabilities, course of action and reaction of the Iranian side, all the more became more frequent. At the same time, the US began to point to the aggressiveness of the actions of the Iranian fleet and conducting of numerous maneuvers in the Hormuz and Bab el Mandeb straits, the PG and the northern part of the Indian Ocean, which interfere with the freedom of navigation, etc. 3. This was followed by Donald Trump’s sharp statements that were directed at Iran on the latter’s failure to respect the spirit of the 2015 agreement on the peaceful nature of its nuclear program. Chief among the latest such attacks against Iran include the October 6th announcement on the imposition of new sanctions on Iran for its missile tests, terrorism aid and sponsorship, and cyber attacks, and the October 8th accusation of the country being in support of the DPRK (Tehran has continued its trade with North Korea). 4. On 13 October, Mr. Trump promulgated a harsh strategy on Iran. Accusing Tehran of interfering in the conflicts in Syria, Yemen, Iraq and Afghanistan, and being in support of Al Qaeda and the Taliban, he proposed changing the terms of the nuclear deal with Iran and imposing sanctions against the Iranian military and political formation of the “Islamic Revolutionary Guard Corps” (the elite unit of the IRI or IRGC Armed Forces). How convincing and complete is the list of these highly controversial US claims for developing such tough pressure against Iran? It seems that a rather long list of Tehran’s “sins” was presented, in which the “nuclear deal” was firstly recognized as the main irritant for Trump. Indeed, it has actually helped Iran to rise to a higher economic and political level in the region and beyond its borders. But according to what mechanisms? In short, this has to do with, firstly, the promotion by the Iranian leadership of the idea of consolidating the entire Islamic world in the face of the challenges of the times. 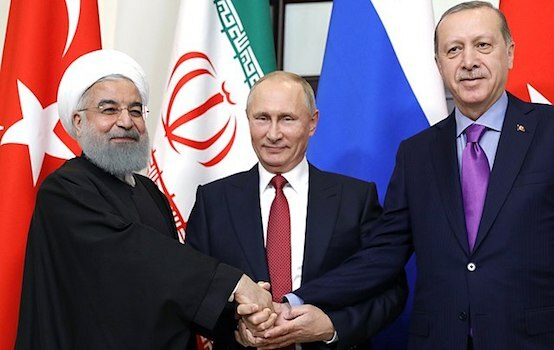 A serious step along this path was, among other things, the establishment of the ‘tripartite union’ to resolve the situation in the Syrian Arab Republic, which included Russia, Iran and Turkey. Secondly, this also involves the aspirations of the country to create a circular arc from its own borders to Lebanon. The project, on the one hand, will greatly expand its sphere of influence and, on the other, is a matter of concern to the United States and Israel, near the borders of which Iran will stake its presence. Thirdly, the gradual recovery of Iranian economic potential and its ties with the West also add to Iran’s importance in the region. With a view to reinforcing both the first and the second, Tehran intends to build a railroad to the Mediterranean Sea, a move that is also unacceptable to the United States. However, one cannot fail to recognize the importance of yet another mechanism in Iran’s attaining of a new level. This concerns the maritime factor, which was addressed by Supreme Leader Ayatollah Sayyed Ali Khamenei in early 2014. He pointed to the need to create a fleet capable of projecting force outside the offshore of the country and operating in the open ocean. 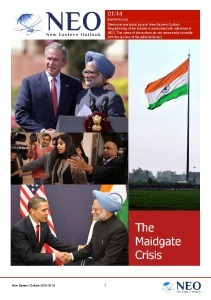 A similar project was drawn up during the time of the Shah regime, when even the search for bases in Mauritius and the Maldives was envisaged, but after its overthrow, it was not up to the task. A strong fleet makes it more flexible for displaying the flag in places where it is needed; establishing a front line of defense and setting up operating bases outside the Strait of Hormuz; patrolling of Iranian communications; creating an additional network of links with partners and reference points, and generally for projecting influence and force. In addition to efforts to produce their own types of naval weapons (despite the secrecy regarding the figures for modernization, in December 2016, Iranian officials again confirmed that they would work both on the aircraft carrier and on the construction of nuclear submarines and ships), Iran considered procurement options, primarily in Russia and China. In February 2016, Iran’s Defense Minister Hossein Dehghan visited Moscow to discuss the supply of arms from Russia worth about USD 8 billion – “Bastion” coastal mobile missile systems, Russian frigates and diesel-electric submarines. Priorities in the 2014-2016 negotiations in Beijing were given to cooperation in the naval sphere and the possibility of Iran purchasing ships, submarines and missiles from China. The growing potential of the Islamic Republic of Iran Navy makes it possible to complicate the military-technical level and expand the borders of the naval maneuvers (an area of approximately 2 million square kilometers) to the Red Sea (this is important for access to the Mediterranean and further to the Atlantic, as planned by Iranian strategists) and the northern part of the Indian Ocean, the development of which is extremely important, including for the further testing of ballistic missiles. During the “Velayat 95” exercises in February and July of 2017, ships of the 47th flotilla simulated a ship battle, practiced the use of aerial drones, and tested various types of ship missiles to protect the trade and oil routes of the Islamic Republic of Iran. Expanding the number of participants in the exercises, in April 2017, the Iranian Navy conducted maneuvers together with Oman on its shores, which, as the Commander-in-Chief of the Iranian Navy, Admiral Hussein Azad, emphasized, were defensive in nature and a response to the “Iranophobia campaign” unleashed by the enemies of Iran. Clearly understanding the increased role of the Indo-Ocean region in world affairs, Tehran has become more active in using naval diplomacy. Thus, since March 2017, IRI Navy detachments have been embarking on friendly visits to Pakistan, India, Oman, Tanzania, Azerbaijan, while plans are also underway for several “flag display” missions in South Africa, the Russian Federation, Kazakhstan, etc. Russian local and foreign media have widely publicized the first visit of a detachment of ships of the Iranian 44th flotilla to the Atlantic, which, however, was not confirmed by some experts. 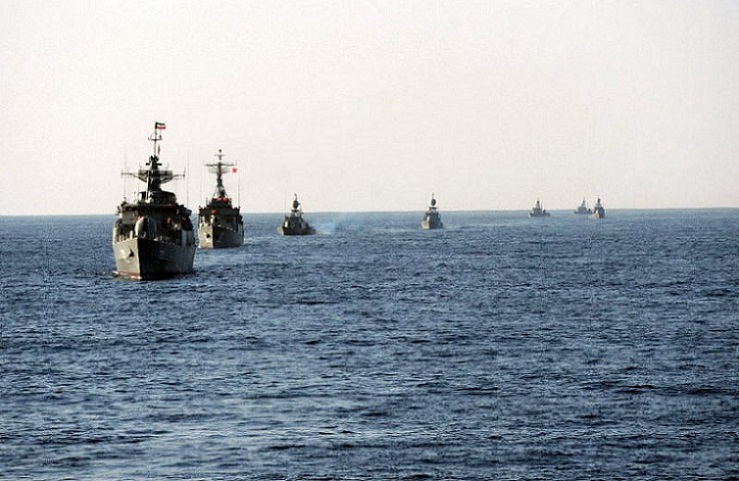 Iran is actively strengthening its ties with a number of coastal countries (Pakistan, Sri Lanka, Indonesia, Djibouti, etc., including in the naval sphere). At the same time, Iranian strategists are drawing up long-term plans to fully mark their naval presence just off the coast of India and in the waters of the Strait of Malacca, which, together with Ormus and the PG, form a strategic triangle of the most intensive flow of oil and goods in a region where Iranian participation in managing it in the interests of the IRI is required. This seems to be the result of a fairly unexpected official statement by the Iranian authorities in November 2016 on the need to establish their own bases (in addition to 6 bases already operating in the PG and 2 bases located on the islands. Of these, Bender-Abbas is the main naval base in Yemen and Syria. According to the admirals of Iran, they will be 10 times more effective than nuclear weapons, and will expand Iranian presence to the shores of the Mediterranean and its ability to render assistance to the allies of the Islamic Republic of Iran. It appears that, while there is much rhetoric regarding these plans, not all of them will succeed, as the power for their implementation is still rather limited. IRI does not seem ready to turn away from its path in its desire to become one of the most active actors of international relations in the Indian Ocean area. And the situation around Iran, primarily its course, whether on land or at sea, will for Donald Trump remain “Headache No. 2” after North Korea.